We’ve compiled several valentines day baking projects that we thought you might want to try out for your sweethearts in the coming weeks. Who doesn’t love brownies? Put them in the shape of a giant heart and not only is it delicious but it’s perfect for your valentine! This one comes from Worthpinning.com and she also incorporates small brownie bites with this recipe as well. Want the recipe? Click here! Chocolate cupcakes are not only delicious but easy to make. These sweet cupcakes have a valentine twist to them by throwing in some cherry flavored chips. Perfect in every way for Valentine’s Day! This one comes from Birdonacake.blogspot.com and you can find the recipe here. Cake pops are a huge hit in the baking world. They are fun to make and pretty all at the same time. They are absolutely perfect for parties giving just the right amount of sweetness to party goers. This one comes from pintsizedbaker.com, you can find the recipe here. You can never go wrong with sugar cookies, and when you add cupcakes & some extra creativity and flair – they automatically add more FUN into the end result. We found this super creative & cute idea by Lisa from thebearfootbaker.com and you can find the step by step instructions here. Have you come across a muffin that’s been in one of those brown “wrappers” and wondered what are those “wrappers” called? 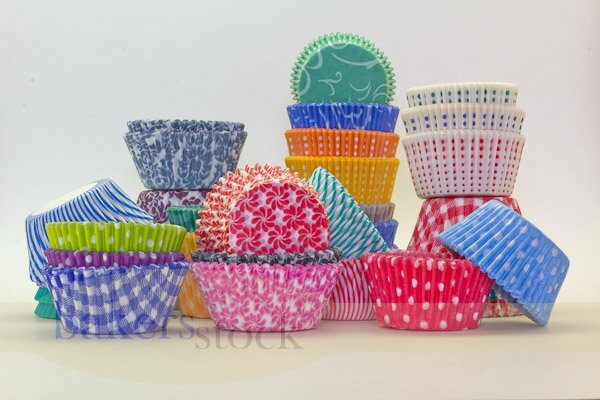 well – they are called Tulip Baking Cups and we proudly carry a full product line of them. What are the colors they come in? What is the bottom/base size of the baking cup? How tall are these baking cups? What does random vs uniform mean? What do all the numbers mean? Where can I get these in large quantities? Ok, so to start – our Tulip baking cups are made with greaseproof paper. You will need to use a baking pan, as these baking cups are not standalone. *Pink is available in limited quantities and sizes only. Get’em while they are in stock! 35 mm Base (~1 3/8″ inches) – these fit a Mini muffin pan. 132 – This correlates to ~1 1/4″ to 2 3/4″. Fits about 3 oz of batter. 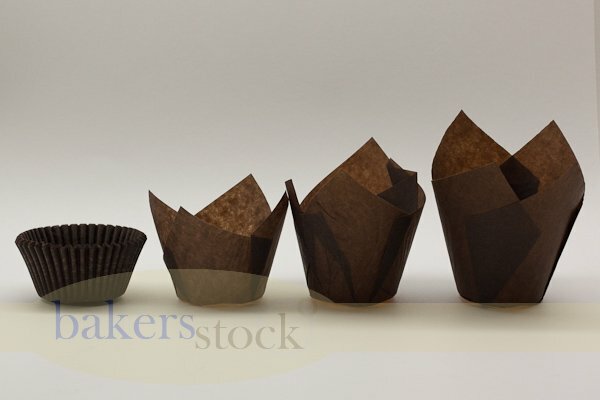 Here is a picture of some of our tulip baking cups compared to a regular cupcake liner to provide a visual of the heights. 110 – This correlates to ~1 3/8″ to 2 1/s”. Fits about 1 oz of batter. This is talking about the tips of the tulip. Random means that all tips in the liner are unique in height and not the same. You could have some taller, shorter, some with 3 tips, etc. Uniform means that all tips in the liner are the same height. There isn’t any variation and all the baking cups will be exactly the same. Would I recommend one over the other? It is just about preference in what you want the muffin to look like as the end product. Some folks like the uniqueness of the random tip and some like the consistency of the uniform tip. Our product listings typically have 3 different sets of numbers. 175 x 50 – Tulip Baking Cups – 2000 count. 175 – this first number is talking about the measurements of the tulip paper when they are flattened out. The larger the number, typically the taller the tulip baking cup. 50 – this 2nd number is the bottom/base dimensions of the tulip baking cup. This will tell you whether it will be fitting into a standard muffin tin or a mini muffin tin. 2000 cnt – this 3rd number is the quantity that is in the product package. Where can I buy them in large quantities? At Bakers Stock of course! Check out our wholesale section for case pricing. Can you believe we are almost to the month of October already? It seems like this year has flown by and with October’s arrival soon upon us it’s time to find some great Halloween baking creations. We have scoured the internet to find the best Halloween baking ideas for you and your family to test out this Halloween. Here are our top 5 Halloween baking ideas. These cookies are spooky and fit the Halloween theme perfectly. They are scrumptious and they will be devoured quickly. Serve these at your Halloween party this year and everyone will love your creepy creations. See the full recipe here. This super cute cake is just perfect for Halloween, and it can also be used at Thanksgiving. You can make this cake in several different ways. You can purchase a pumpkin shaped cake pan for the easiest way to baking this sweet creation. If you are more talented you can try your hand at sculpting this cake in the shape of a pumpkin. Learn more about this awesome cake creation here. These delicious chocolate cupcakes are extra special with their cute skeletons on top. Surprise your party guests with these delicious and cute skeleton cupcakes. They are relatively easy to make and everyone will love them. Who needs candy when you have cake? Don’t forget your cupcake liners, you could use black, brown, or orange for this delicious treat. View the full recipe here. These awesome cupcakes are extra special, you pull them apart for an awesome effect that they kids will love. It imitates a real spider web and they are delicious too! Everyone will love this neat cupcake treat and we think you will too! See the full recipe here. These cake pops are going to be a huge hit with the kids, give them out as treats for trick-or-treaters or serve them up at your Halloween party. They are delicious and bring the Halloween spirit to wherever you decide to take them. See the full recipe here. It isn’t quite yet 6 months since we celebrated my little boy turning 2….and as the saying goes “better late than never”, so I’m proudly sharing some pics from his train themed birthday celebration! Selecting the theme for his birthday was pretty easy this year – he loves trains. He has a Thomas the Train wooden railway set that he plays with every day, so the thought of a train themed party seemed to fit right along his interests. Despite his birthday being in November, it had been a rather warm fall (Yes, we live in California) – so we opted to celebrate at the local neighborhood park. For the cake, I decided to order a cake from the local grocery store and accented it with a train topper that I made from gum paste. I got the how-to tutorial from this blog post and loved the idea of adding a couple extra train cars to carry two candles! For extra dessert (we can’t only have cake! ), we had some chocolate cupcakes and marshmallow pops! I designed some printable invitations, cupcake flags and and then with putting some bright blue tablecloths on the benches – it brought the park right to life! For the party favors, I used some clear boxes, filled them with some train themed goodies and tied them up with red twine and blue twine! All in all, it was a great day. My little guy was thrilled to spend the day with family and friends and enjoyed several rides around the park on the Choo Choo train! Spring Sale! Selected items 40% off! Let’s start off this new season with a sale! Selected items are 40% off in the shop. 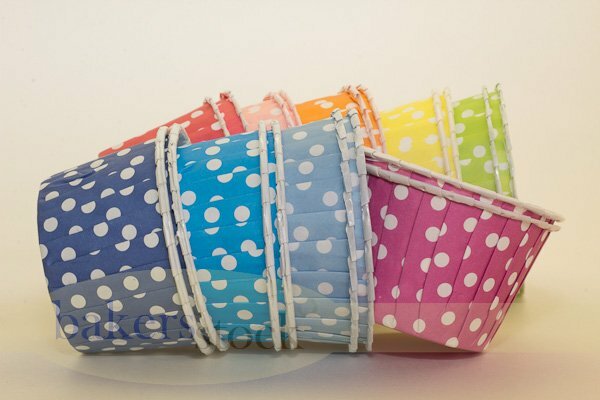 Highlights include: Polka Dot baking Cups, Paper Straws, Americolor Gels, Cookie Cutters and some Party Treat Bags. Shop now!